One of the four golden eagles Sunkar is releasing into the wild this fall. 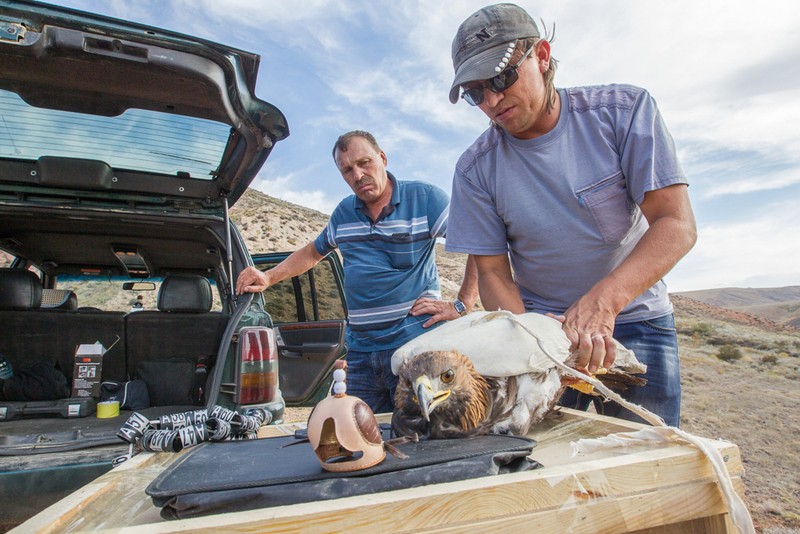 Sunkar breeds birds of prey both for legal sale, mostly to hunters from the Middle East, and for release into the wild as part of a conservation program. 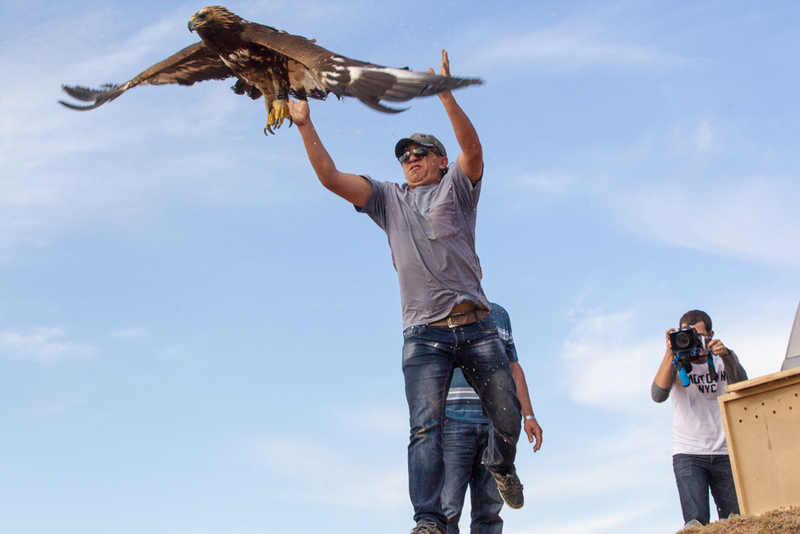 Golden eagles being released into the wild at Sunkar in 2013. Poachers still have major incentives to trap birds of prey, which fetch hefty sums in the lucrative illegal global trade in rare and endangered species. With an irate toss of its bronze wings and a scrabble of its razor-sharp talons, a young golden eagle protests as it is loaded into a cage at a bird sanctuary in southeast Kazakhstan. Glaring from its beady eyes, this proud chick is clearly not enamored with being held prisoner. But its captivity will not last much longer. The bird is one of four golden eagles being released into the wild this fall as part of a program to preserve birds of prey in Kazakhstan. This chick was born a few months ago at the privately owned Sunkar sanctuary in Almarasan, just outside Kazakhstan’s commercial capital, Almaty. 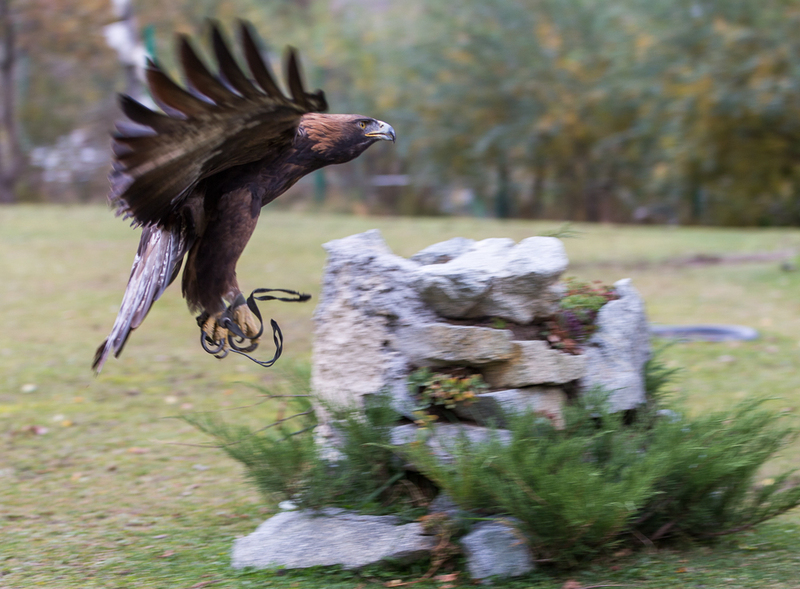 As well as golden eagles, the center breeds and releases saker falcons, which are classified as endangered on the International Union for Conservation of Nature Red List. The global population is “undergoing a very rapid decline,” and the drop is “particularly severe” in the birds' Central Asian breeding grounds, the IUCN says. Kazakhstan’s national Red List offers an even more dire assessment of the state of the species inside the country, which it describes as “dramatically reduced in number” and “threatened with extinction,” mainly because of poaching and trapping. 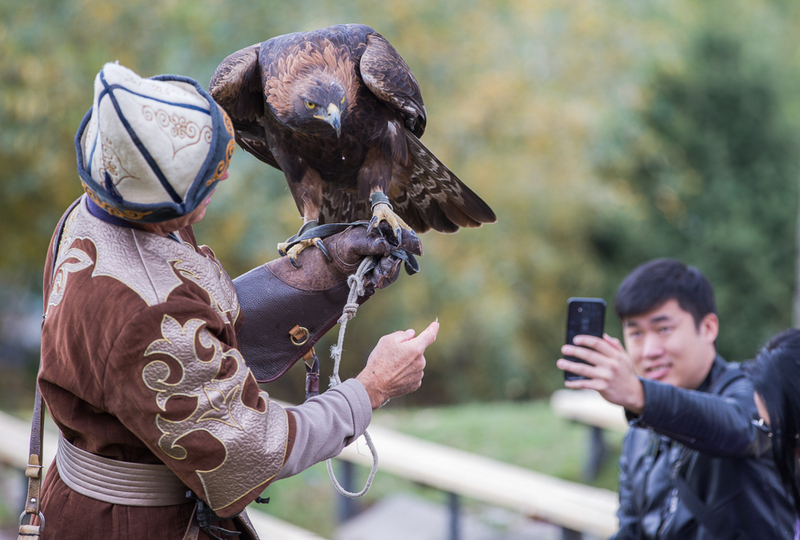 Both the saker falcon and the golden eagle are prized for hunting in Kazakhstan, though the country has only a few real berkutshy (eagle hunters) left still practicing this ancient art. Yet poachers still have major incentives to trap birds of prey, which fetch hefty sums in the lucrative illegal global trade in rare and endangered species. 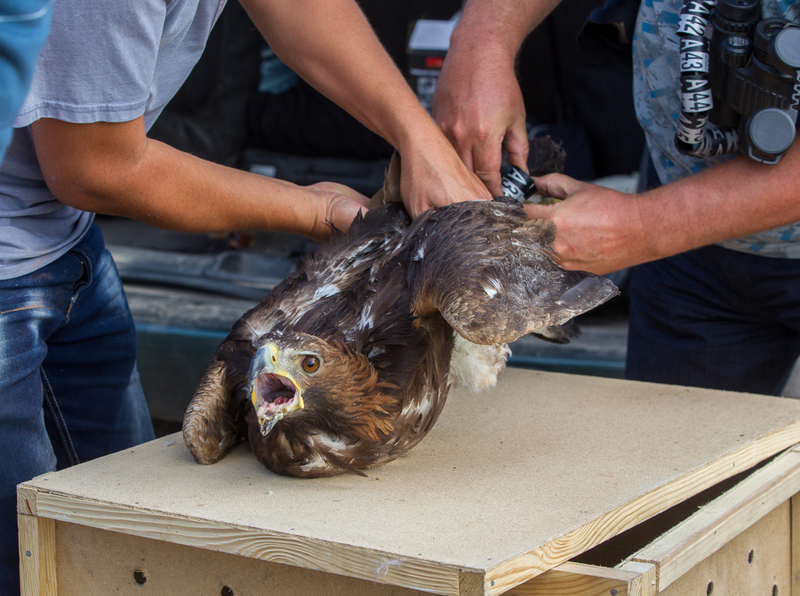 Despite efforts to combat poaching in Kazakhstan, trappers have come up with all kinds of inventive tricks to grab the elusive birds, from enmeshing falcons in fishing nets to scaling cliffs with professional climbing equipment. Sunkar – the sanctuary is named for the word falcon in Kazakh – was set up in late Soviet times to preserve the saker falcon and currently houses around 400 birds of prey from 15 species native to Kazakhstan. In its near three decades of existence since its founding in 1989, it has released 638 sakers into the wild. 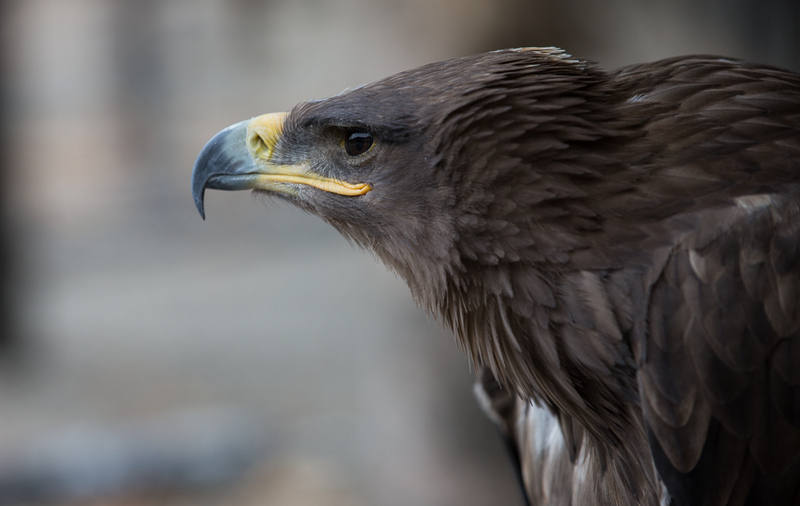 In recent years, it has also started breeding golden eagles for release under a program sponsored by the Efes Kazakhstan brewery which has seen 25 of the birds set free since 2013, including the four being released this fall. The private sponsorship is welcome, because Sunkar, which is owned by entrepreneur and Almaty city councilor Viktor Bulekbayev, receives no financial support from the government for its conservation efforts. From birth, the birds that will be freed are raised differently from those bred for commercial purposes, to hone their survival-of-the-fittest tactics ready for a life in the wild. The chicks are placed in an aviary from which they can see only the sky and the surrounding slopes of the Ile Alatau mountains. The handlers observe their charges through tinted windows so that the birds do not know they have human caretakers, and surreptitiously place live animals such as chickens and mice in the cage at night to feed their voracious appetites. 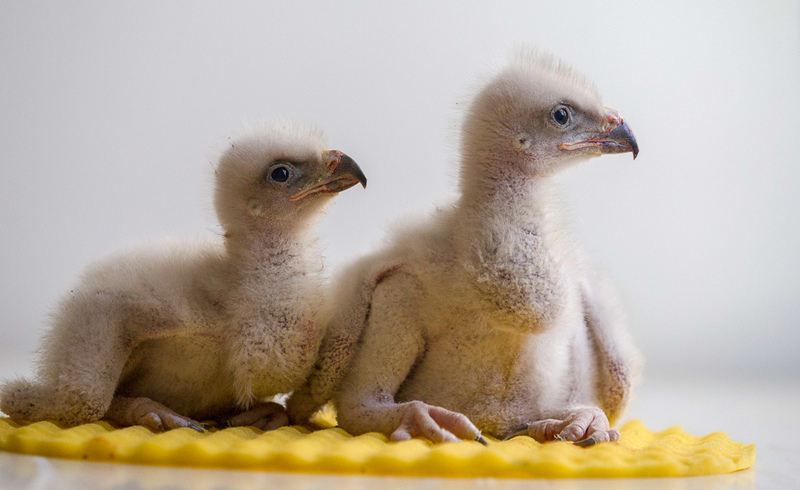 The chicks grow fast, and after just a few months they have built up enough weight, strength and survival experience to take flight in the wild, making another small contribution to the conservation of rare birds of prey in Kazakhstan. Joanna Lillis is a journalist based in Almaty. Pavel Mikheyev is a photographer based in Almaty.